In a historical tasting, Jose Penin, for the first time ever, in an official capacity, came to Israel and tasted through some 32 or so wines, and then tasted them against his own country’s wines as well. Jose Penin, is no stranger to the wine world, he is the Robert Parker of Spain, and has been doing this for some 35 years, and is world-renowned for his tireless drive and professionalism in the world of wine. In 1990 he released his first book on the wines of Spain, and has continued this every year since, adding to it and augmenting the wineries he visits as more come online. Yair Gat is not as well known as the late Daniel Rogov was in the English-speaking blogs and public, because Mr. Gat writes in Hebrew and pretty much stays to himself. Still, Yair Gat is a highly accomplished wine writer that writes a wine article for Israel Hayom, a daily newspaper in Israel. The tastings accorded over three days, with Penin, included some winery visits and the chance to taste some 32 wines, were all put together by Hacarem/Vineyard. Hacarem, is one of the largest and most influential Israeli wine & liquor importers, which imports many Spanish wines into Israel including one of my favorites; Elvi Wines. The event was really a three-part affair, starting with Penin presenting Spanish wines in Israel, where the audience was mostly wine professionals. The tasting with Gat and Penin was a private affair and was put on for the benefit of all involved, which turned out to be a wonderful opportunity for Mr. Penin to get an appreciation of Israel’s wine potential. There was also an evening where Elvi Wines were the main event, called Elvi night with Spanish tapas, music, and of course Elvi wines! This was put on for the buyers of Elvi wines in Israel. I was so happy to see that the preconceived notions and/or opinions that Penin came with – were not the notions he left with! He came, with the imagery that the public media paints for him, a land filled with desert plains and its people affected by the need to live in constant strife. Bless-fully, he left with real story – a land filled with people whose hearts are open with joy and happiness, irrelevant to its strife, and hungering to learn and grow as a people, economy, and country. I was also, so happy to see that the word kosher only appeared at the end of the article and that the large majority of it was spent talking about the makeup of the land, the agriculture, viticulture, the climate, the history, its people, and its wonderful wines. Of the 32 wines he did taste – he liked the Yarden and Castel wines the most. His favorites were the Castel Grand Vin, the Yarden Heights Wine, the Yarden Odem Organic Vineyard Chardonnay, and the epic Yarden ROM. Please read the entire post of his, the translation is pretty good, excepting for a few glaring mistakes like when he describes the 2008 Castel Grand Vin, as a bad Medoc – AHH!!! The translation meant to say; if I had not seen the bottle/label I would have thought it was a Medoc. 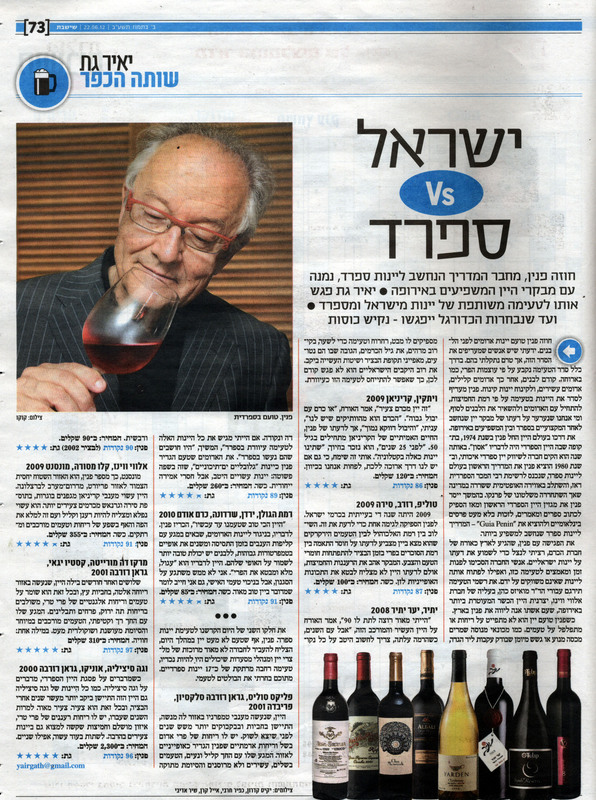 Either way, the article by Gat (attached above) and the blog post by Penin both show the unbelievable range of Israeli wines and their potential. As an aside, Yair Gat and Penin tasted some four Spanish wines as well. One of my favorite kosher Spanish wines that did well is the Clos Mesorah from Elvi Wines, which I wrote about and rated in my article on Elvi Wines. Penin and Gat placed it comfortably in the same range as wines priced many times its cost. So congratulations to Elvi Wines again for its continued assault on the wine world and for the acclaim that it rightfully deserves. I was really happy to see that the international wine world is starting to get a glimpse and appreciation for the potential of wines in Israel. There are clearly many hurdles that the Israeli wine industry needs to address, including price and quality. However, as we have seen from my latest post on Recanati Winery, the clear QPR leader in Israel, and the continued good press from Wine Spectator and other wine media outlets about the Israeli wine industry as a whole, there is much to be proud of as well. So, before turn totally Pollyanna, I wanted to throw a huge shout out to Mr. Penin, the folks from Hacarem, Moises Cohen and family, Mr. Gat, and all those that were part of this epic undertaking. The goodwill and information that you have all spread to the wine industry can only help to bolster the image of Israel and its wine industry, which I hope in turn, will help it to continue to improve and grow as a quality producer of wine throughout the world. Posted on July 13, 2012, in Israel, Israeli Wine, Wine, Wine Industry, Wine Tasting and tagged Elviwines, Jose Penin, Moises Cohen. Bookmark the permalink. Leave a comment.